Hey Wiregrass area! Looking to get tatted up just in time for swimsuit season? If so, visit our friends at Prodigal Son Tattoo, located in Enterprise, AL. Chilly and his staff of tattooists have the right masterpiece or piercing to compliment your skin. They also offer beard, hair and shaving products as well as numbing soap and an assortment of aftercare products. 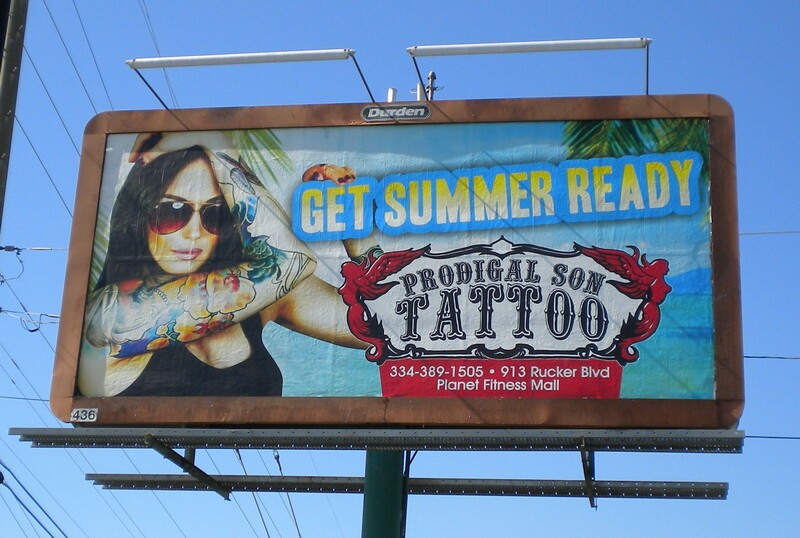 Prodigal Son Tattoo has been utilizing billboards for two years now. When asked, Chilly stated that Outdoor Advertising gives them the most “bang for their buck” compared to other advertising. It has outperformed other mediums while giving their business more legitimacy over similar businesses in their industry. Prodigal Son Tattoo uses our 4 week rotary poster program. They have one poster that rotates every four weeks throughout the Enterprise market. This allows them to change their message to promote seasonal and event based products and services. Rotating to new areas of the market each month also makes them appear as if they are everywhere. 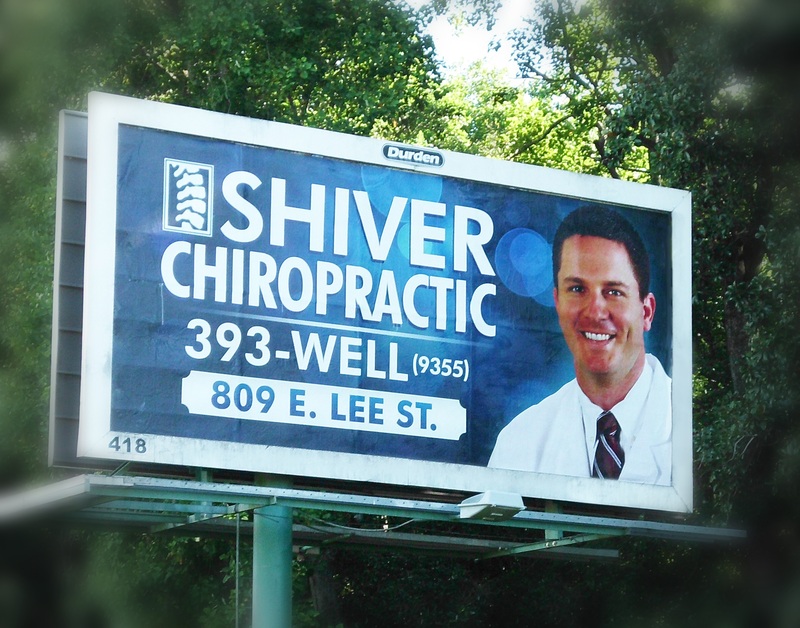 They have had several customers who have come in and said, “We see your billboards all over the place.” We love working with companies to achieve success through creativity in Outdoor Advertising. Prodigal Son Tattoo is a great group of people to work with and we are excited to continue making them FAMOUS in the Wiregrass. If you would like more information on our rotary poster packages, contact one of our sales reps today at 334-792-5056 or sales@durdenoutdoor.com. 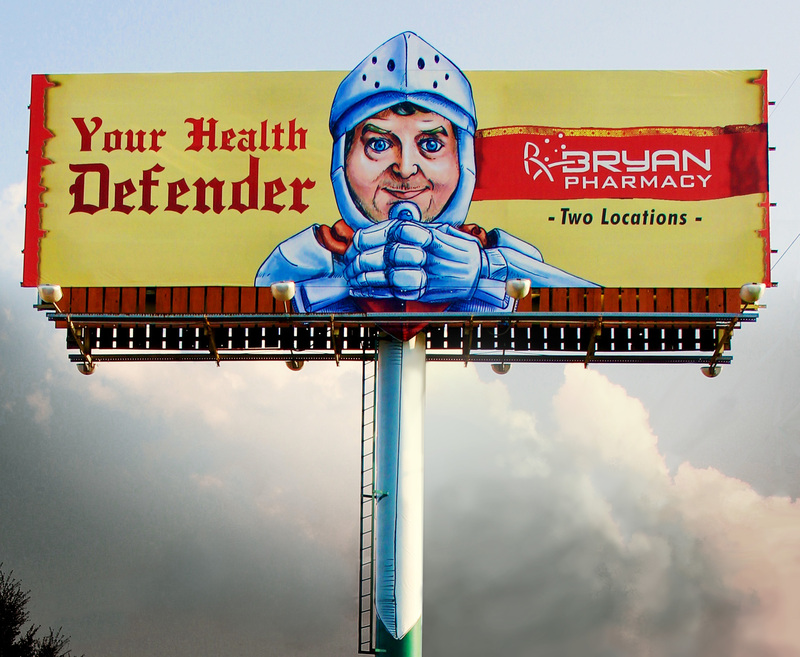 Dothan Pharmacy is a local, family-owned pharmacy who was looking to make a powerful statement to Dothan’s southside motorists. 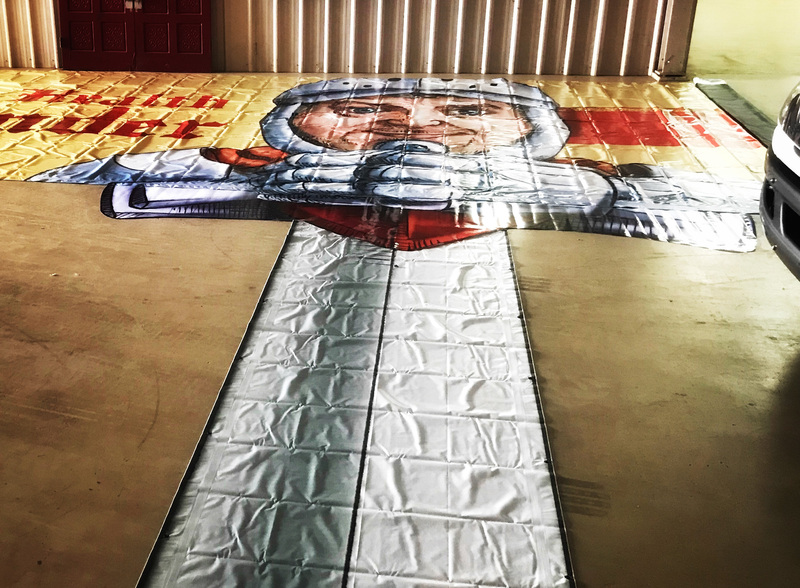 After discussing ideas with the client, we determined a large bulletin along one of Dothan’s highest traveled arteries was just what they needed. This billboard’s purpose would be two-fold. Primarily, it needed to announce the new store location. We accomplished this by creating a larger-than-life 12 foot tall pill bottle and added a massive directional arrow to essentially slap drivers in the face and say “HEY! 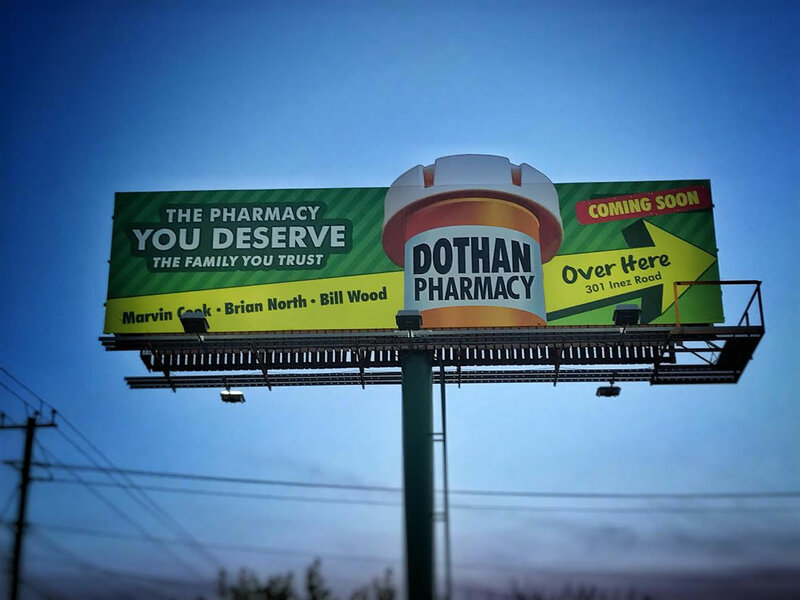 WE ARE OVER HERE!” The billboard also needed to convey to viewers that Dothan Pharmacy is not a big box-store pharmacy, unlike their competitor down the road. But rather friendly, fast and family owned. We thoroughly enjoyed working with these guys and can assure you that if you are in the market for a new pharmacy, Dothan Pharmacy will treat you like family. 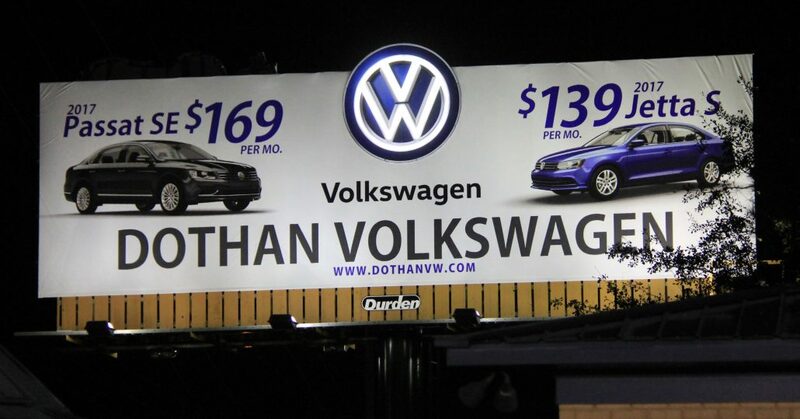 If you would like more information on how to increase your bottom line, contact one of our FAMOUS Makers today at 334-792-5056 or sales@durdenoutdoor.com. Hey Wiregrass! Does your BIG financial institution have you feeling like you simply don’t matter? If you live in Houston, Dale or Coffee County, then IAM Community Federal Credit Union just may be the credit union for you. IAMCFCU has been serving members of the Wiregrass area since 1964. They specialize in everyday needs for financial services such as signature, home, vehicle and farm equipment loans. Almost two years ago, Durden Outdoor Displays, Inc. was given the opportunity to partner with IAMCFCU to help promote the services they provide. IAM Community Federal Credit Union utilizes several rotary posters allowing them to rotate every 4 weeks through out the Enterprise, Ozark and Daleville Markets. Since they started running billboards, they’ve been reminded by their members of how effective their campaign is. 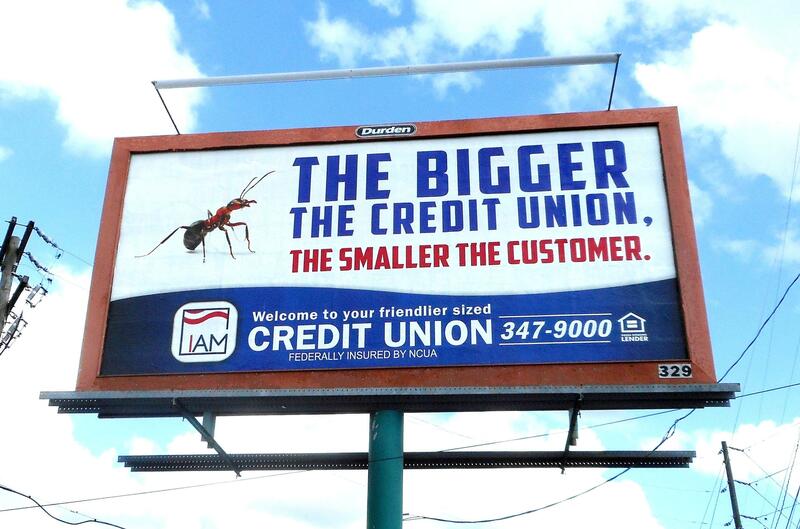 Recently, a new customer came in to one of their branches quoting the slogan from their billboard, “The bigger the credit union, the smaller the customer.” After finding out about the services they provide, the individual became a member. If you are looking for a new financial institution that treats you like family, stop in IAM Community Federal Credit Union to speak with one of their representatives. They are conveniently located in Daleville and Enterprise. To learn more about increasing your bottom line through out the Wiregrass area, contact one of our FAMOUS Makers today at (334) 678-2215 or sales@durdenoutdoor.com. If you would like to be FAMOUS in the Wiregrass area, give us a call today at (334) 792-5056 or you may email us at sales@durdenoutdoor.com. Recently, one of Durden Outdoor Displays, Inc.’s long time clients, River City Grill in Eufaula, Alabama, approached us about advertising a new pizza restaurant they were opening. Our creative department got to work and came up with a campaign that would feature River City Grill and what would become the new hotspot of Eufaula, Graffiti’s Pizza Joint. Both of these restaurants are located in beautiful Downtown Eufaula. 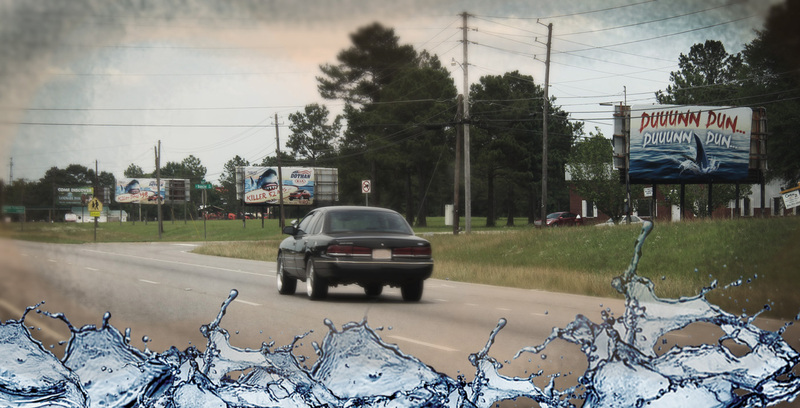 After working through a couple of designs and tweaks, the creative was installed on three major artery bulletins, targeting northbound and southbound traffic into Eufaula on Hwy 431. 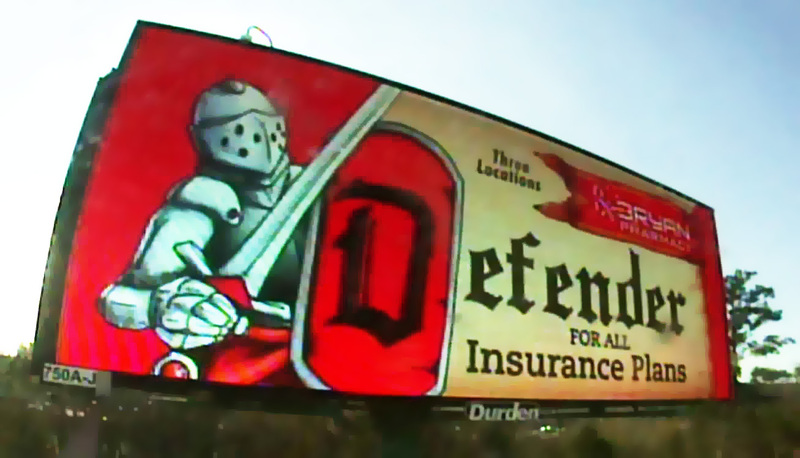 The billboards not only served as top of the mind awareness but also as a directional for non-local traffic headed to Columbus and Atlanta or to the beaches. 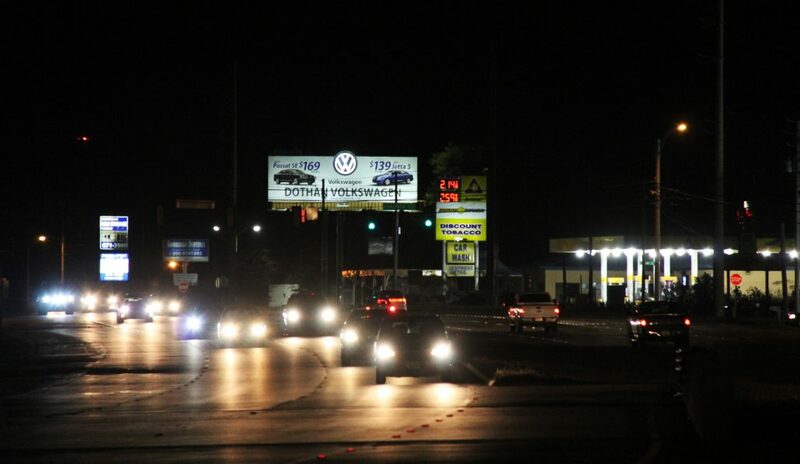 Stephanie Ryan, partner and marketing director of Graffiti’s, said they have seen a significant increase in traffic and sales since their billboards went up. “We receive compliments everyday,” stated Ryan. If you are in the Eufaula area and have a craving for a fresh New York-style pizza, steak and shrimp or just a great sandwich, check out our friends at River City Grill & Graffiti’s Pizza Joint, where you are sure to leave full and happy. Durden Outdoor Displays, Inc. offers bulletins, rotary posters, and digital billboard advertising in the Barbour County market. If you would like to be made FAMOUS through out the Wiregrass area, give one of our FAMOUS Makers a call today at (334) 792-5056 or you may email us at sales@durdenoutdoor.com. There’s a Killer… Deal in Dothan! There have been shark sightings all across Dothan. Fortunately, they are only here to promote Kia’s “Killer” Deal on the 2017 Niro LX at DOTHAN KIA on the Ross Clark Circle. With summer in the air, and Shark Week only 2 months away, we wanted to channel an icon of cinema that referenced both. Jaws was a force to be reckoned with, just like the Niro LX with its 52 mpg city. We were also able to incorporate a triple board message on Hwy 431 across from Northview High School for this campaign. 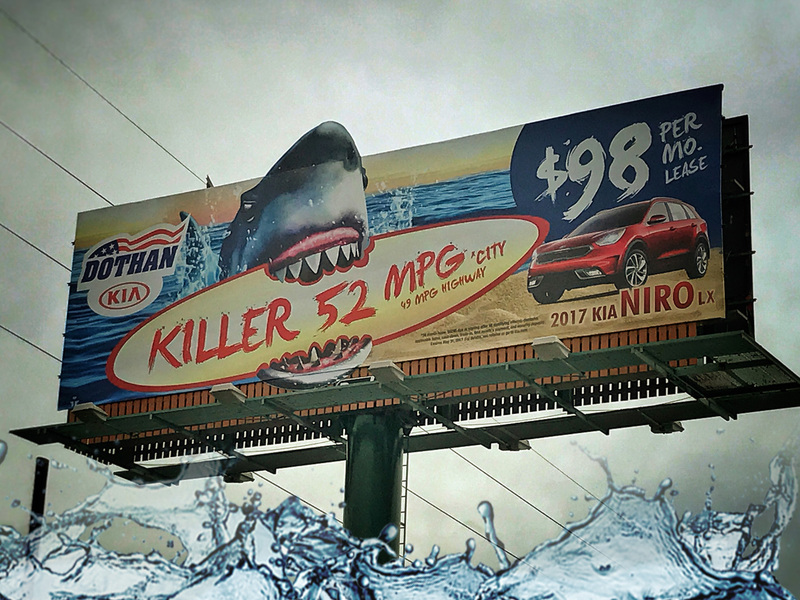 The Durden creative team created this concept with headlines like “Killer Deal” & “Killer MPG”. They were great attention grabbing lines, but they really needed a look to drive the message home. Then it came right out and bit us, we needed the perfect image of a great white shark chomping down on a huge surfboard! Everything came together then, the client loved it, and the rest is history. 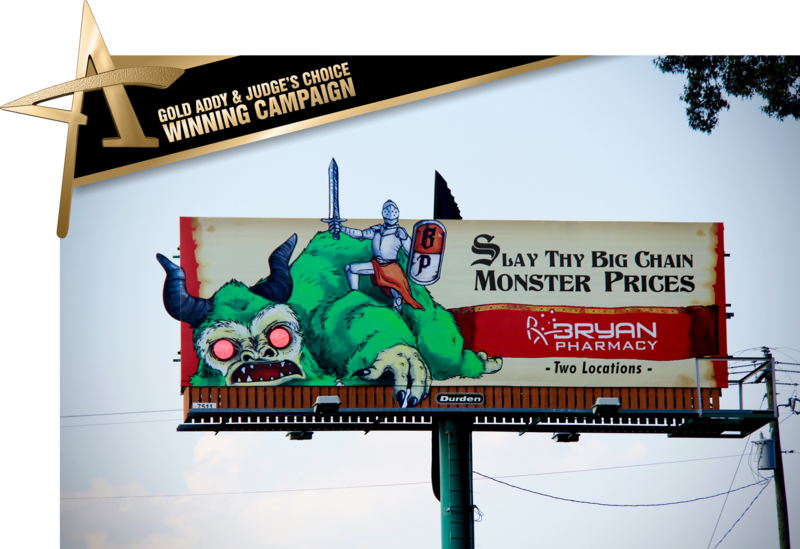 If you need a creative concept to make your business FAMOUS, check out our specials page, give us a ring 334-678-2215 or email at sales@durdenoutdoor.com. http://www.durdenoutdoor.com/wp-content/uploads/2016/06/DUR-Footer-Logo.png 0 0 Martin Whaley http://www.durdenoutdoor.com/wp-content/uploads/2016/06/DUR-Footer-Logo.png Martin Whaley2017-06-01 22:04:502017-06-02 16:45:01There’s a Killer… Deal in Dothan! Are you finding out that you need more storage? Let Baker Metal Works and Supply in Troy, Alabama help you with your needs. Baker Metal specializes in Pole Barn Metal Building designs. These weather resistant structures can withstand winds up to 140 miles per hour, with over 25 different colors. Baker Metal offers delivery and same day service as they manufacture it all on site. 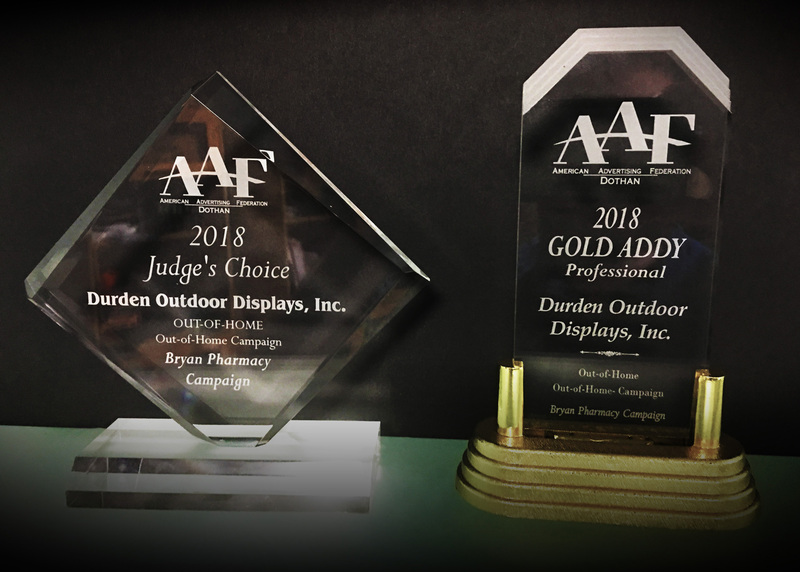 Durden Outdoor Displays, Inc. has had the privilege of partnering with Baker Metal Works and Supply to help spread their message through out multiple counties. By utilizing the entire Digital Network and our Rotary Poster program, Baker Metal has been able to reach new customers through out all of the Wiregrass including transit and rural customers. 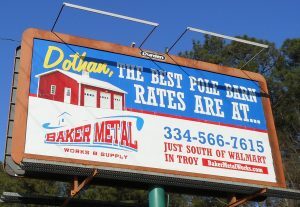 They have targeted and spoken to specific areas by incorporating city and town names in their tag line, “Dothan, the Best Pole Barn Rates Are At…Baker Metal.” General Manager, Ray Robley, attributes a 60% increase in “Do It Yourself” clients to their Durden Digital Network and Rotary Poster Campaign. If you would like to see growth in your business, please contact one of our FAMOUS Makers today at (334) 792-5056 or sales@durdenoutdoor.com.